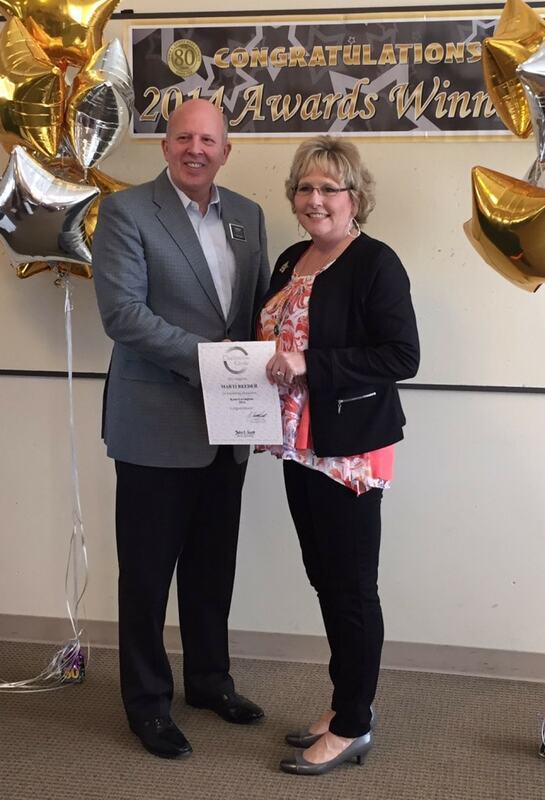 Marti Reeder, Realtor®, Broker, CRS for John L. Scott in Kent-Covington was recently awarded one of John L. Scott’s highest honors – the Chairman’s Circle Award – for her top grossing real estate sales in 2014. As one of John L. Scott’s top producing Realtors® in Western Washington, Chairman and CEO J. Lennox Scott personally presented the award to Reeder in February. “I’d like to thank and congratulate Marti Reeder, a John L. Scott award recipient, for the role she played in helping her valued clients achieve the American dream.” — J. Lennox Scott, Chairman and CEO, of John L. Scott. Last year, Reeder received John L. Scott’s President’s Elite Award, another top John L. Scott honor, for being a top producer in 2013. Reeder has earned a president’s award from John L. Scott every year since 2007. The John L. Scott awards are in addition to a collection of other honors Reeder has received in recent years, including being voted “Best Real Estate Agent” by readers in the Kent Reporter’s annual “Best of Kent” contest. Reeder has been named “Best of Kent” in 2008, 2009, 2010, 2012, 2013 and 2014, and she is a nominee for the 2015 “Best of Kent” honor. Click here to vote for Reeder in this year’s competition. Voting ends April 17. Reeder has also been named a “Five Star Real Estate Agent – Best in Client Satisfaction” by Seattle Magazine for four of the last five years. “I LOVE my business because it allows me to serve my community by helping families and individuals own a piece of the American Dream. Homeownership has a direct impact on the stability of our community and that’s important to me and good for all of us!” Reeder added. As a lifelong resident of King County, Reeder works with clients throughout the greater Seattle area, with a focus on South King County and the South Sound. She also focuses on educating home buyers and sellers on the value of home ownership and ensuring that they understand changes in the real estate and mortgage industries and how they are personally impacted. For more information about Reeder, visit MartiReeder.com or call 253-859-8500 (office) or 206-391-0388 (cell). You can also read testimonials on LinkedIn, Zillow, or “Stik” reviews on her Facebook page (https://www.facebook.com/martireeder), and click here to view her latest listings at http://johnlscott.com/martireeder. If you are searching for a home, download Reeder’s GPS Home Search app from your tablet or smartphone. With 10 years as a Realtor® and more than 30 years of industry experience, Reeder works out of the John L. Scott office in Kent-Covington. She is a full-time, full-service real estate broker, serving the South Puget Sound region. She has a wide range of experience in mortgages, home inspections, construction and real estate. In 2014, Reeder helped 35 families buy or sell homes. Reeder is a Certified Residential Specialist (CRS), representing only 3% of the Realtor® population. CRS agents are dedicated professionals working to ensure their clients receive exceptional service by tapping into their extensive training. Reeder also specializes in staging and marketing her listings as well as helping buyers, whether they are first-time homebuyers or are downsizing or upsizing from their current homes. When not listing or selling homes, Reeder can be found blogging about real estate or playing with her new grandbaby and is active in the Kent community. She is a member of the Kent and Covington Chambers of Commerce, Kent Downtown Partnership and Kent Kiwanis. Learn more about Reeder at MartiReeder.com.